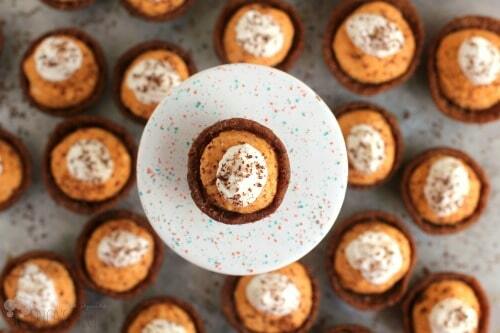 Pumpkin Cannoli Cookie Cups. 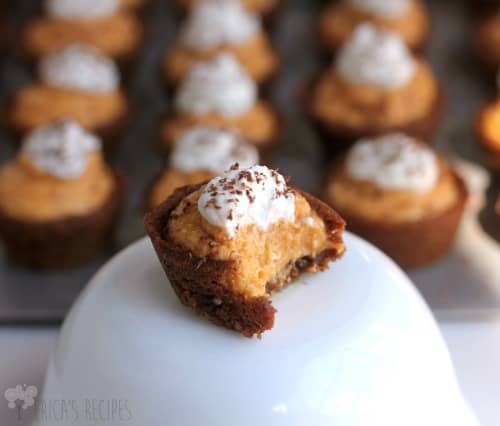 Little bites of creamy pumpkin love in chewy gingersnap cookie cups are so tasty and completely adorbs! So, I owe you an apology. October has come and gone, Thanksgiving is almost here …and I have not given you a single new pumpkin recipe this year. 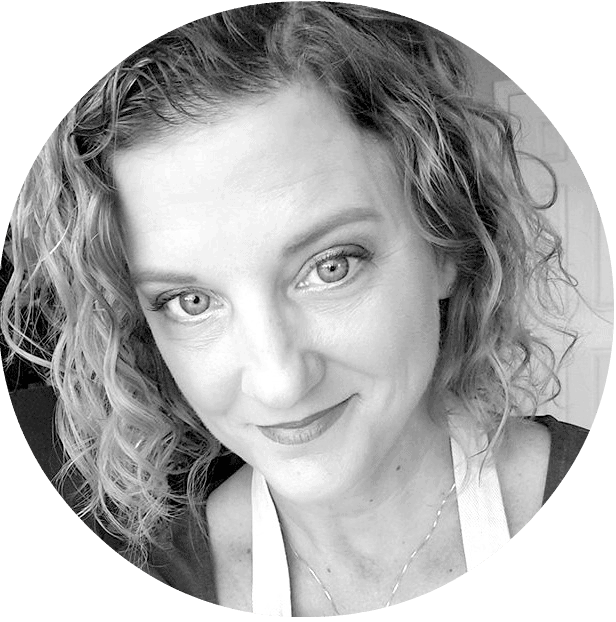 I see hundreds of recipes a day, and the pumpkin posts started flying in August (which is kinda like Christmas commercials mid-November), so I think at some point I dug in with “not gonna do it.” See, I want to keep you alllll stoppin ovah and checkin out mah goods, but I only share with you things I really eat when I eat them. And I hadn’t done pumpkin yet. …Regardless, mea culpa. Thank you for sticking with me. Maybe you’ve tuned out all-things-pumpkin too? BUT this little sweet munchity munch makes up for it right? So we’re good? Excellent! Alright, these little bits of heaven are brought to you by my old recipe for Gingersnaps (which are chewy because that’s how I like them!) and a new pumpkin cannoli filling. These are SOOOOOOO good. They are like …what would result if a pumpkin pie and a cannoli had a baby. Yea, I don’t get that either but that does create an image doesn’t it? And I love that these are not too sweet – they are perfect! So funny that I got the pumpkin inkling and made these – took a bite and sighed… oh thaaaat’s right. I love pumpkin. Like a real cannoli, you don’t want to add the filling to the cookie cups too early because moisture will leach into the cookie and soften them right up. 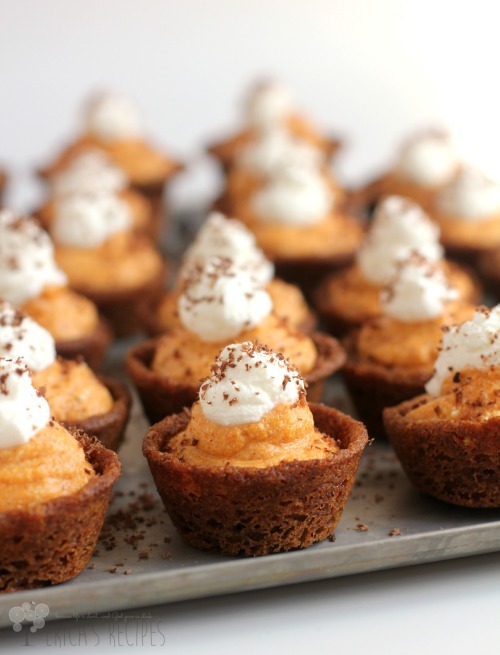 These Pumpkin Cannoli Cookie Cups are chewy, but we don’t want them wet, right? Both the cups and the filling can be made a day ahead, but then just put them together when you are ready to serve – and using a ziploc bag to pipe the filling in makes this super quick and easy too! To make the cookie cups, heat the oven to 375F. Roll the cookie dough into balls no larger than an inch in diameter. Place each ball into a tin of a mini muffin pan. Bake at 375F for 10 minutes or until all the cookies puff and fill the tin, and then collapse forming the cup (this is why you don't want the dough balls too big - they will rise and spill over the edges of the muffin tins). Remove from the oven and set aside to cool a bit to allow the cookies to firm up. Gently remove the cookie cups from the muffin pan onto a wire rack to cool completely (using a knife helps). 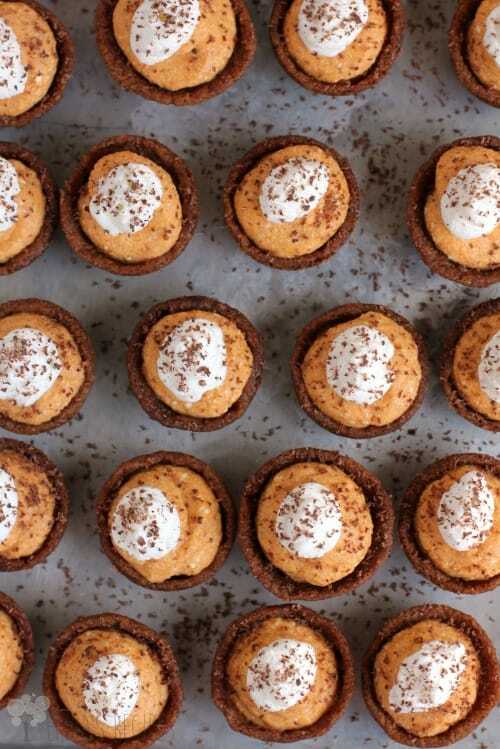 To make the filling, simply whip together the pumpkin, ricotta, cream cheese, 1 T cream, powdered sugar, vanilla, nutmeg, cinnamon, ginger, and salt. Spoon the cannoli mixture into a large ziploc bag. Snip off a corner of the bag and pipe the filling into the cookie cups. To make the Bourbon Cream: whip the cream until the beater starts to leave tracks in the cream. Add the bourbon and granulated sugar, and whip until soft peaks form. Just like with the cannoli filling, use a ziploc bag to pipe cream onto the filled cookie cups. Using a cheese grater, grate chocolate over the cookies. Serve immediately. Both the cookie cups and cannoli filling can be made in advance, but don't put them together until you are close to serving. Just like regular cannolis, the filling will eventually soften the cookie cups. If made ahead, store the pumpkin mixture in the fridge and store the cookie cups at room temperature in plastic containers or under plastic wrap. Yield: 48 bites. What a great idea. My husband is a huge pumpkin pie fan and a cannoli fan, he’s going to love these. Love, love this recipe! Can’t wait to try it. Yes, please! These look so delicious!! These are lovely and definitely worth the wait! I pretty much live for ricotta and cream cheese. These look like heaven to me. I just LOVE your blog so much. Thank you for this recipe. So good. Ok, you sold me when you said pumpkin cannoli, but when I read bourbon cream I was there already! Sound wonderful! I’ve never had a canoli, and I’m heading to New York in less than two weeks (yay!!) I can’t wait to get my hands on one – but this, this version looks like the perfect holiday twist!! Not only that, they are adorable to boot! I seriously love, love, love this recipe! 🙂 I am a sucker for anything pumpkin and for cannolis, so this dessert is a dream come true for me, lol! There is absolutely nothing about this idea I do not like! I bet they are awesome and I love that they are bite sized too! Too cute for words! 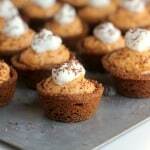 These would be a perfect addition to my Thanksgiving dessert tray! Love it! 15 Make-ahead Thanksgiving Dishes for a Stress-Free Holiday | bowl of delicious! Not only does this recipe look delicious, your photos are gorgeous. Great job!! 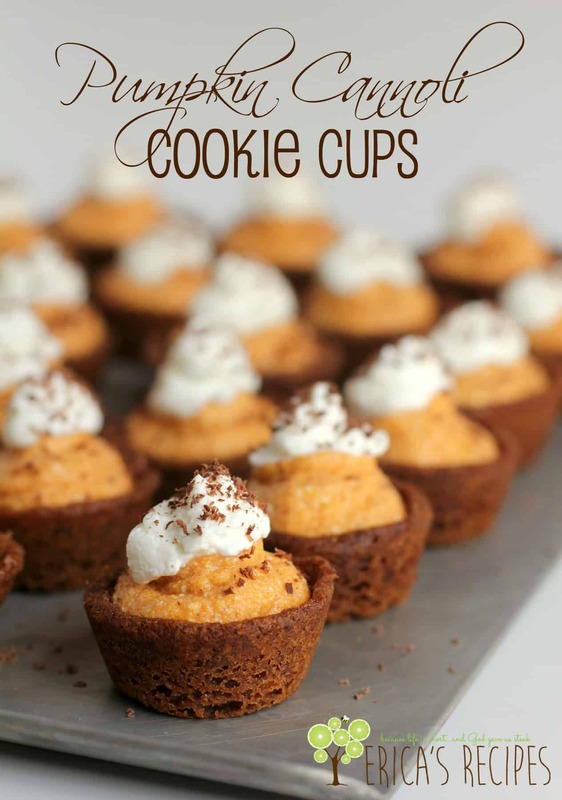 What a great idea making the cookie cups!